Come to Vendée where sea and sky blend into a never-ending expanse of blue. Come with friends or family, come for the sun, the rocky coast, the sandy beaches and unspoilt islands. Vendée has some 250 kilometres of protected coastline, 140 kilometres of sandy beaches, over 100 protected species living in an area of 2,000 hectares, 450 kilometres of cycle paths. From the campsite, you can cycle to the town centres of Saint Gilles Croix de Vie or Brétignolles sur Mer. 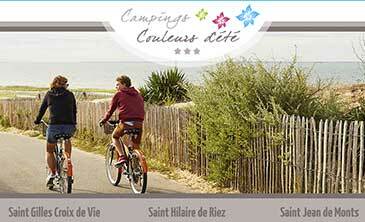 LES CYPRES, 3-star campsite is in the seaside town of St Gilles Croix de Vie. We look forward to welcoming you to our peaceful, shady campsite. Our Mobile-Homesare ideally located, 400 metres from a sandy beach via the dunes. There are also two swimming pools, (One indoor heated pool with jaccuzi and one outdoor pool with children’s paddling pool.). Explore the coastline on foot or on bicycles, with family or friends. Come to our campsite and lose track of time! We offer a range of comfortable 2–3 bedroom mobile homes with covered decks. The campsite is open from the friday 5 april to the 15 of september 2019.